Young French right back Dika Mem was one of last season's best surprises. 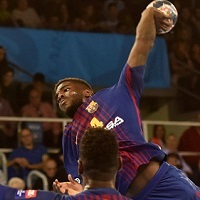 Just two years after he graced the French third division court, the 19-year-old joined FC Barcelona and made it to his first VELUX EHF Champions League FINAL4. “Maybe I wasn't expecting to be playing at that level last season, but the coach put a lot of trust in me. It feels like the confirmation season to me, and I feel like I’ve been doing pretty well so far,” says Mem, who has not only been key in Barcelona, but was also a core player when the France national team claimed bronze at the EHF EURO 2018 in January. The young Frenchie also hopes that Barcelona’s home arena Palau Blaugrana, which enjoys an explosive atmosphere on important Champions League occasions, will help his team come the return leg on Saturday. “We saw in Montpellier that their fans were a real asset for them. Hopefully our fans can do the same for us. Palau Blaugrana is a historic place for handball, one that has always helped the club over the years. I really do believe we can turn things around one more time,” says Mem. If Barcelona do turn the tables, it will take the club one step closer to fulfilling their objective: to reach Cologne once again. In June last year, Mem said that playing the FINAL4 was a childhood dream for him – and he wants to be there again in May. “Once you’ve played the FINAL4, you want to be part of it every year. But we're not foolish, we know that we’ll have to first play better on Saturday if we want to go there,” says Mem, who does not want to think further ahead than the return game, during which his team will have to perform better than they have lately to have any chance. “We almost lost a couple of games and we might have struggled sometimes in the Champions League, but I'm sure about one thing: everybody is only thinking about winning by four on Saturday,” concludes Mem.